Well folks, it has been quite a year this year for all of us here at Silver Oak Online Casino and it will soon be time for taking a step back and looking at all the work we’ve done. It can be rather gratifying to look at all your work and realize that you made people happy with it. To honor this moment and to try and keep the tearjerkers out, we have made a list of Realtime Gaming’s best slot game releases. Feel free to check them out; these are some real doozies. Have you ever dreamed of entering the glamorous world of modeling and luxury? Now you can get a taste of the high life with Real Time Gaming’s game High Fashion; get in with the in crowd of elites and jet setters and enjoy. The fashion industry was made for you, and you were made for the fashion industry. So why not make yourself a part of it? High Fashion sports five reels of pure glamour, glitz, luxury, models, and contracts. With a local progressive jackpot you can ride this cash all the way to Paris or Milan. The major jackpot resets at $1000 and the minor jackpot resets at $250, and the top award goes all the way up to 2,500 times your bet per line. Put on your best clothes and your nicest shoes and get ready for a life of High Fashion. Are you brave enough to defy the shadows in the bog and learn the ways of Voodoo? Come and do so with Voodoo Magic, the mesmerizing game that is all about the dark and occult ways of Voodoo. The stunning artwork and the crazy effects will have you jumping out of your seat. The eerie Voodoo Priestess and the creepy Voodoo doll are just what you need to make your darkest wished come true, as long as they are to win loads of cash. If you learn to master the Magic Multiplier, the strongest of the Voodoo incantations, then you will be well on your way to becoming a very rich voodoo master. 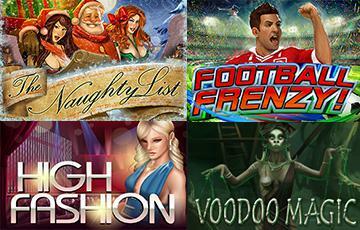 Make the riches flow in with Voodoo Magic. If you have been naughty this year then you might be expecting Santa to leave you a giant lump of coal or possibly not even bother sliding down your chimney. This year, let us reassure you that Santa has decided not to be so judgmental towards the naughty people. As a matter of fact, he has decided to reward them instead. Unbelievable, is it not? We know you are going to thoroughly enjoy The Naughty List, especially during this holiday season. It has two jackpots, a major one and a minor one. It also has a top award of 3,000 times your bet per line. The Naughty Pick feature will have you feeling like a child again right before opening your presents. The difference is that this time you get to open way, way more. Celebrate Christmas the way you are supposed to, Naughty. For all you soccer lovers that watched the World Cup, here is an exhilarating game that will make you feel like you just scored the winning goal at the World Cup. Just imagine blazing down the sideline and you get the perfect pass from your teammate; you zip towards the center, burn one and then two defenders, take aim, and rip a blazing hot shot at the goal, on that the goalie does not reach. GOAL! This animated slot game will take you there. With 50 pay lines and bets ranging from 5 cents all the way up to $50, this innovative slot game comes with a progressive jackpot and the true blue World Cup experience. There is a lot more from Real Time Gaming that promises a great time and huge pay outs. Stop by and check out the entire selection from RTG at Silver Oak Online Casino.